Watermelon Seed Spitting Contest is a Mini Battle featured in Super Mario World 2: Yoshi's Island and Yoshi's Island: Super Mario Advance 3. Yoshi and Bandit must spit watermelon projectiles at each other. 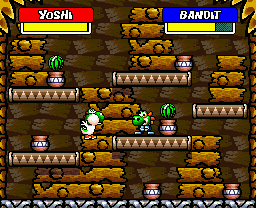 The game starts with Yoshi next to a watermelon on a pot. The player can swallow a green watermelon and spit out seeds. The Bandit now has a Yoshi mask on, so he can spit seeds as well. Yoshi must spit the seeds at the Bandit, who hides behind walls. At random, a red watermelon may come up, which can severely damage the opponent. If Yoshi wins the mini-game, he gets a Super Green Watermelon, Super Red Watermelon, or Super Blue Watermelon item card at random. Using the cheat to access the Bandit minigames from the world map will unlock a 2-player variation of the minigame. Grab a watermelon and shoot your enemy as quickly as you can. Reduce your enemy's power meter to 0 to win! This page was last edited on December 3, 2018, at 21:32.